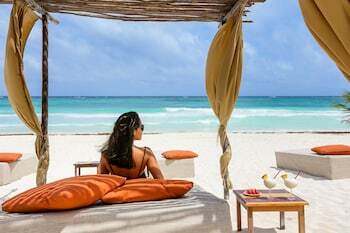 When you stay at ARENABLUE TULUM in Tulum, you'll be on the beach and steps from Tulum Beach. Featured amenities include a 24-hour front desk, multilingual staff, and luggage storage. A shuttle from the airport to the hotel is provided for a surcharge (available 24 hours), and free self parking is available onsite. With a stay at Cinco de Mayo Hotel in Queretaro (Downtown Queretaro), you'll be within a 10-minute drive of Santa Rosa de Viterbo Temple and Ignacio Mena Rosales House of Culture.